Beijing(web team): Prime Minister Narendra Modi on Thursday night arrived in Beijing on the second leg of his three-day China visit during which he will hold talks with his Chinese counterpart Li Keqiang tomorrow on issues of mutual interests including the boundary issue and the trade imbalance. At the Great Hall of the People, Modi and Chinese Premier Li Keqiang are expected to discuss the boundary issue. The talks will also focus on the trade imbalance which is in favour of China to the tune of US $38 billion. Modi is expected to seek support for his 'Make in India' initiative while inviting Chinese investments in the country. 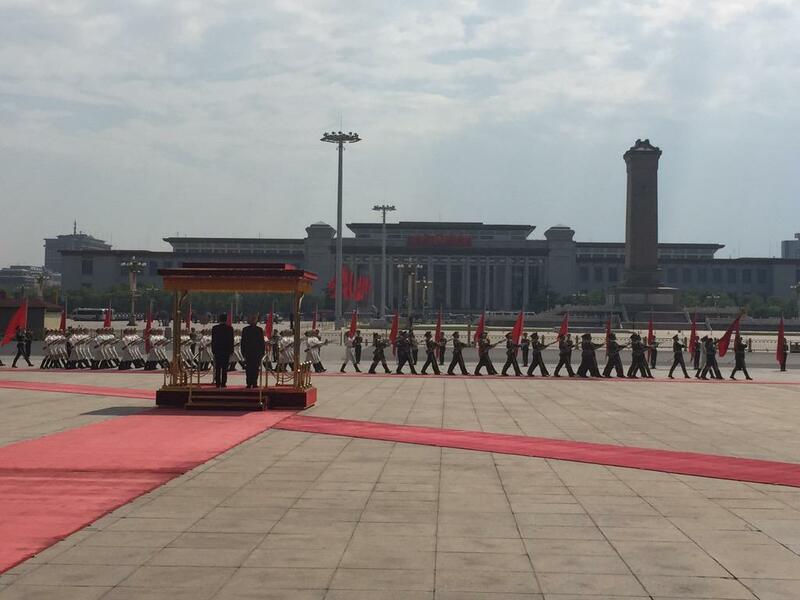 The official welcome in Beijing. Welcome ceremony held for PM Modi with Chinese Premier Li Keqiang at Eastern Plaza, Great Hall of People. A special thanks to President Xi Jinping, with whom I had an extremely productive meeting earlier today. Modi will meet Zhang Dejiang, the Chairman of the National People's Congress (China's Parliament). Modi will also addresss students at the prestigious Tsinghua University following which he will travel to Temple of Heaven where he will witness a Yoga-Taichi Joint event before leaving for Shanghai on the third leg of his China trip.